Spectacular dental procedure on a big cat in Denmark: The CEREC CAD/CAM technology was actually developed for humans but was successfully used for the first time on a lioness in a Danish zoo. 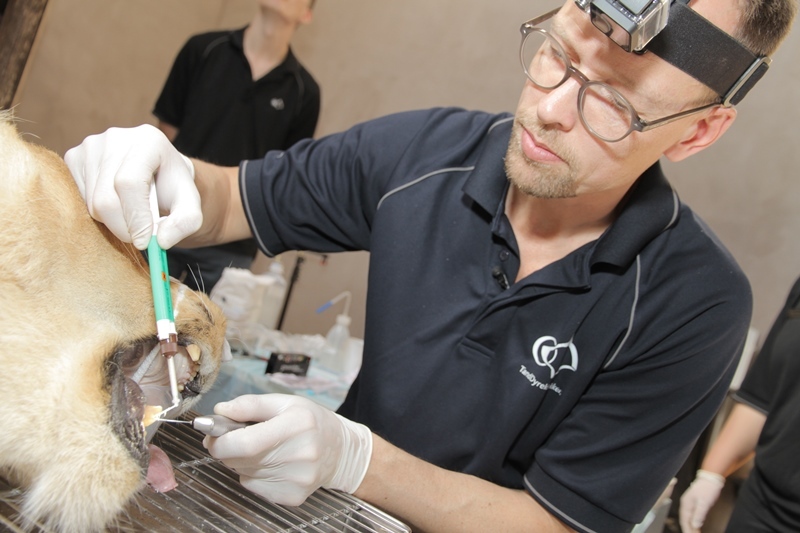 After Danish zoos received negative headlines in the press over the past few months, one Danish zoo is now attracting positive attention – with a spectacular dental procedure. The damaged carnassial tooth of a lioness in Ree Park Safari in Ebeltoft (near Aarhus) was restored using the CAD/CAM system CEREC. The Danish zoo wanted to use the benefits of the chairside system, which allows treatment in just one session, for its animal patient. The veterinary team was faced with a few challenges when operating on the 12-year-old African lioness Naomi.Adult lions cannot be anesthetized for more than two to three hours, meaning that the entire procedure needed to be completed in that period of time. Since extracting such a large tooth is difficult and lions need the carnassial tooth to be able to bite, a root canal treatment was carried out and the tip of the carnassial tooth was fitted with acrown. The CEREC method allowed the entire treatment to be successfully completed in just a single procedure. “Anesthesia is very stressful for wild animals. This was unavoidable for the root canal treatment but we did not want to put Naomi through it a second time to fit the crown,” says vet Jens Ruhnau, who led the operation. Naomi recovered from the operation quickly without any complications and is now back to her old self. Treating such a big cat shows how the universality of CEREC. “The clear advantage of using CEREC since it requires only one procedure to take a digital impression of the tooth and carry out the restoration is beneficial not only for humans,” says Birgit Möller, Head of Product Management CEREC at Sirona. After treatment was successfully completed, all those involved were clearly relieved. “It was a fascinating procedure and I am sure that it will not be the last time we use state-of-the-art technology like CEREC to improve the lives of our animals,” said Jesper Stagegaard, the director of Ree Park.